Two brave plods Wippo and Wop must disperse a riot. Help them to jump between the protesters and to smack down the most radical ones. The more protesters you knock down, the more points you will earn. Are you ready to feel yourself like a true policeman? Good luck! 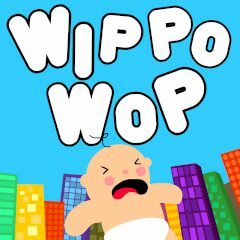 Meet the two brave policemen named Wippo and Wop. Today they are taking part in a riot dispersion and need your help, otherwise anarchy will reign the city soon. Jump between two tightropes and smash the rebels with batons. You will get a certain amount of points for each punished criminal in this online arcade game. Try to complete all the levels as quickly as possible! Good luck in this game developed by Newgrounds!